To find a Safe Place location, enter your zip code below. You’ll be provided with a list of Safe Place sites nearest you. 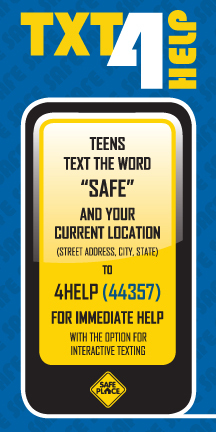 To use TXT 4 HELP, text the word “safe” and your current location (city/state/zip) to 4HELP (44357). Within seconds, you will receive a message with the closest Safe Place site and phone number for the local youth agency. You will also have the option to text interactively with a professional for more help. It’s quick, easy, safe and confidential.